Last Tuesday, Ohioans gathered at the polls to cast their votes for the November 2018 election. That same evening, a group of thirty Ohioans gathered at the Eastern Agricultural Research Station in Belle Valley for the sixth and final class of the 2018 Southeast Ohio Sheep and Goat School series. While most people were watching television to see election results, these folks were watching The Ohio State University Meat Science Professor, Dr. Lyda G. Garcia, share insights on carcass evaluation followed by the breakdown of both a lamb and goat carcass from primal, to sub-primal, and retail cuts. 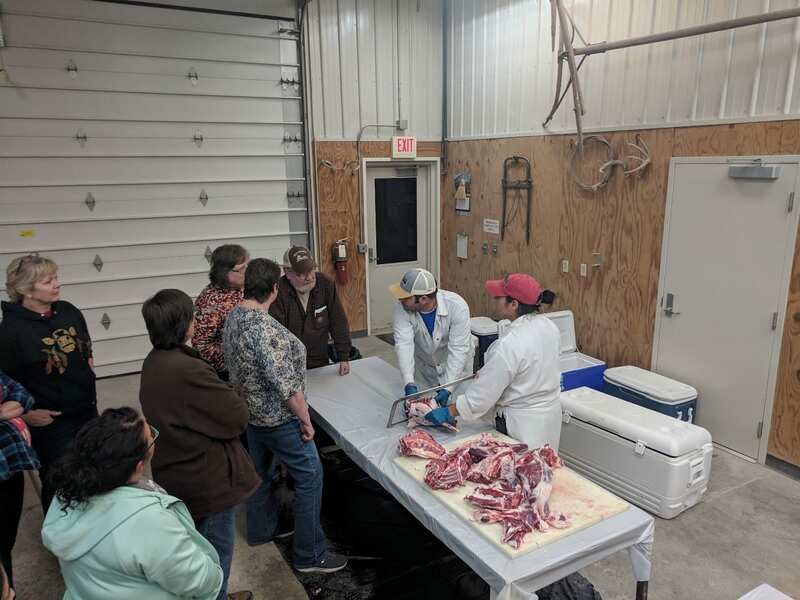 Ohio State Extension educators from the Southeast Ohio Region worked together to coordinate the program with the goal of providing small ruminant producers with the tools they need for success in the industry. 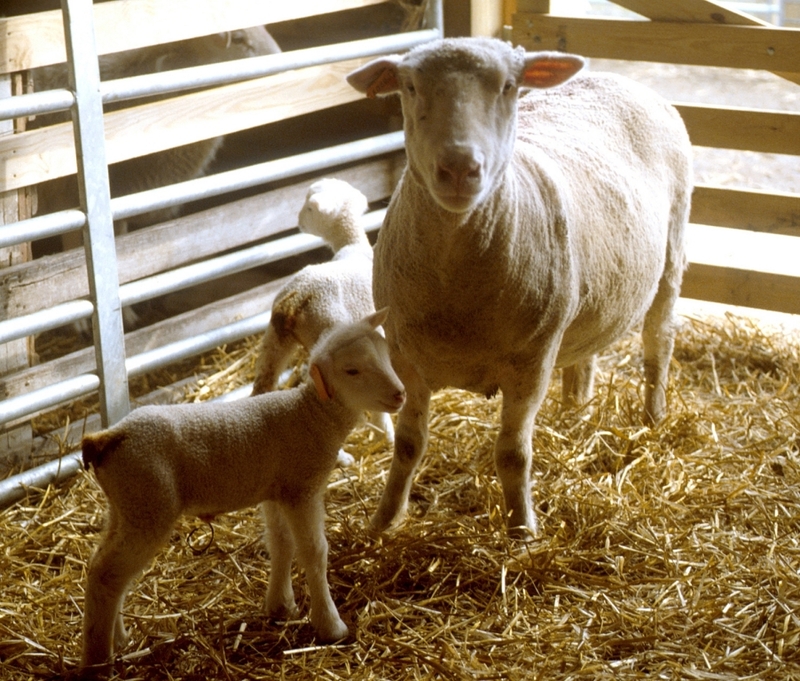 With few resources available for goat production in Ohio, special emphasis was given to include relevant information for both sheep and goats in each program. As a whole, the program covered topics including anatomy, nutrition, animal behavior, breeding, birth, growth, predator and disease control, pasture management, marketing and more. The final class was tailored to address appropriate feeding methods that create a favorable meat product for the American market, with an understanding of how proper feeding translates to carcass quality. Following a homemade lamb dinner, Brady Campbell presented a review of alternative finishing systems for feeding out sheep and goats. Mr. Campbell is currently a PhD student at The Ohio State University and serves as the OSU Sheep Team Program Coordinator. His current research pertains to parasite pressures in Ohio flocks and the effects of delayed weaning on pasture. He administers the Ohio State Sheep Team webpage, providing readers with both timely and timeless advice about sheep production. Interested shepherds can follow the webpage by visiting www.sheep.osu.edu. Following Mr. Campbell’s presentation, Dr. Garcia provided the class with an overview of the primal cuts of lamb and goat. With the help of Pernell Saling, of Saling’s Custom Meat Processing in Caldwell, Dr. Garcia fabricated both carcasses into retail cuts as the audience watched, hanging on her every word with Garcia sharing a bit of humor. Dr. Garcia works as an educator, team leader, extension professional, and researcher for The Ohio State University’s Animal Science Department. With her vast experience in the meat industry and refreshing enthusiasm for her work, Dr. Garcia provided producers in the class with a better appreciation for the meat they produce and the people who love to eat it. Demand for a 2019 program is strong, with inquiries drifting in from Ohio, Pennsylvania, and West Virginia about future classes. In response, the OSU Sheep Team will work to address the needs and interests of our producers with the turn of the year and happily include those across the state line. This program would not have been possible without the continued support of the Eastern Agricultural Research Station and their staff, our County Extension staff, and the local community. We sincerely thank each person that spent time on this program during 2018! Special thanks for the final class are extended to Tara Voda and Scott Campbell of Noble County for providing the lamb for the demonstration, Kelley Hughes of Washington County for providing the goat, and Saling’s Custom Meat Processing for dressing the animals and providing hands-on assistance during the demonstration!